Peggy and I have been a member of Lakewinds Natural Foods Co-Op for about six years and have shopped there many more than that. 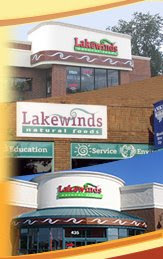 Lakewinds is a full service cooperative grocery store that specializes in organic, natural and locally produced products all with a high level of customer service. They have three locations serving the suburban Twin Cities area: Minnetonka, Anoka, and Chanhassen. We highly suggest you take some time out and visit the location nearest you. One of our favorite items featured at Lakewinds is their illustrious "Lakewinds Pasta". This alone makes any shopping trip worth it. If men are from Mars and women are from Venus then Lakewinds Pasta is from Jupiter because the flavor is that immense. Curly al dente Cellentani (corkscrew) pasta adorned with accolades of garlic, olive oil, sun dried tomatoes, kalamata olives sinfully intermingled with Romano and Parmesan cheeses, pumpkin seeds, and balsamic vinegar. My mouth is watering just thinking about it. 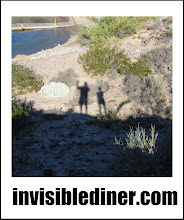 For those daring enough to try this recipe at home I have included it right here on Invisible Diner. Viva La Pasta! Enjoy. Cook pasta until al dente. Drain and cool. Soak sun-dried tomatoes in hot water for about 20 minutes to soften. Slice into thin strips. Slice olives in half, length-wise. Combine pasta, sun dried tomatoes, pumpkin seeds, olives, scallions, Romano and Parmesan cheeses and basil in a large bowl. Combine dressing ingredients in a blender; pure till combined. Add dresssing to salad and chill one hour before serving. hellooooo! I'm getting pretty hungy for some new restrants to try out. I keep checking and checking and checking and checking. Nothing! Did Jack Yee's Shanghai you two or what?